A Timing Station is a high power, Low Frequency (LF), ground wave radio broadcast system that provides a time code 24 hours per day. Low Frequency is used to enhance accuracy and reduce the possibility of atmospheric interference. Used primarily to synchronize radio controlled consumer clocks (RCC), these dedicated time signal stations can achieve an accuracy of a few tens of milliseconds. Patented CEC Technology allows for up to 50% shorter antennas, which decreases the required land to approximately ¼. Atomic watches and clocks around the world rely on signals from CEC transmitters to maintain accuracy. 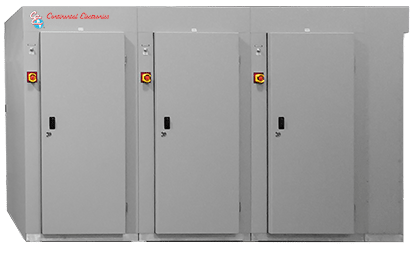 Power levels available from 50kW to 2MW. Frequency – any desired frequency, VLF, LF, to MF. 100kW per fully populated RF amplifier cabinet with 10% margin level redundancy. 64 air-cooled plug-in power amplifier modules per cabinet for ease of maintenance and repair. Green Technology – Solid State Amplifier with AC-to-RF efficiency greater than 80%. Equipped with CEC Patented technology to permit the utilization of shorter antennas lowering deployment cost. Equipped with Digital RF Amplitude Control for generation of IRIG Pulse. Fiber transport employed for all data communications to prevent RF interference with digital streams and control links. Helix Coil for bulk inductance in antenna tuning. Protective spark gap protects Helix Coil from lightning induced transients. Variable inductors (Variometers) provide continuous fine adjustment of inductance for antenna tuning control; a second variometer performs loading control to match antenna resistance. CEC-designed motor and controls packages provide complete closed-loop control of fine-tuning. Helix coils and Variomoters designed and manufactured by CEC. CEC’s Gas-Cap® Capacitors typically used in matching networks along with variometers to match transmitter output impedance to loading coil. Fixed and variable models designed and manufactured by CEC. Available current ratings to 400 A, capacitance to 25,000 pF and peak voltage ratings to 85 kV. CEC has produced highly reliable gas capacitors since 1947. LF antenna design knowledge and proprietary software tools. Experts in Electrical Design for LF/VLF Applications. Antennas are designed for mechanical stability to preserve desired accuracy of system. Electrical design takes into account advanced technology contained in CEC transmitters to provide an optimized economical overall system.